But after about five years of traveling and trying various solutions, we seem to have finally gotten it all worked out. We installed Michelin LTX M/S LT235/75R15 tires (Load Range C) on the trailer in January of 2010 and replaced the ceramic brake pads with semi-metallics at the same time. About a year ago, in October 2010, we met up with Super Terry to do a maintenance check and everything checked out perfectly. 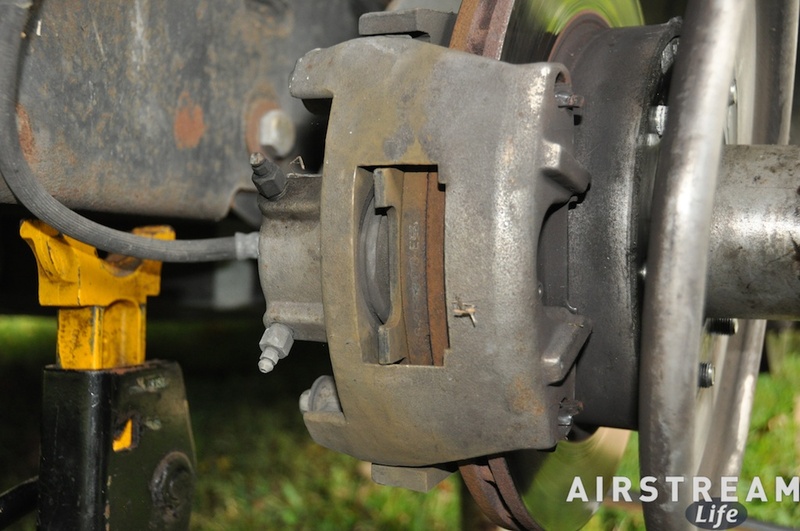 Since then, we’ve put about 8,000 additional miles on the trailer, for a total of approximately 18,000 miles of towing on this set of brakes and tires, so I decided it was time to do another check. And so here we are with Super Terry again, about one year later. I figured that we’d probably need something at this point, so my other goal was to learn the full disc brake replacement procedure, along with best techniques for re-packing wheel bearings. But when we pulled the wheels, everything was perfect. Absolutely no service needed. So I didn’t get a chance to observe much of anything. The tires currently have 12/32″ of tread depth remaining (they started with 13/32″, so barely any wear so far). 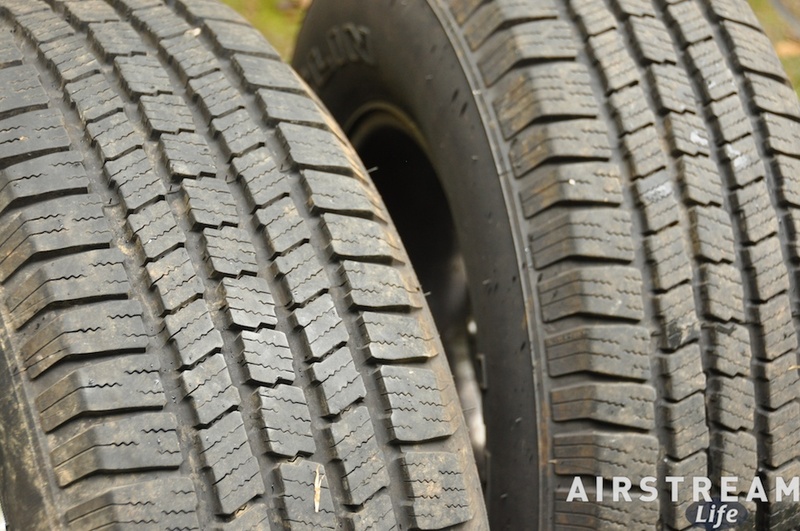 If we eventually replace the tires when they reach 4/32″ of tread, we’d have over 160,000 miles on them. That’s incredible. Realistically, with uneven wear that usually occurs or just aging, we’ll replace them with about 75,000 miles on them — still incredible compared to the 30,000 mile life I would get if I could wear out an ST tire before it had a belt failure. The disc brakes were similar. I could not see any wear since last year. (We didn’t measure the pads but they are still in excellent condition.) I’ll continue to do annual brake and tire checks but that’s just good practice. We finally have a really reliable running gear setup. Given the excellent condition of everything we observed, we decided to skip wheel bearing service at this time. We did notice slightly more wear on the rear tires, which is normal, so we rotated the tires front-to-back. We also took the opportunity to replace the remaining original lug nuts, which were cheap-o type with fake chrome caps on them. The chrome caps tend to come loose at inopportune moments, which makes them very hard to remove. They also stretch so that fitting them into a socket can be difficult. We found solid nuts at Autozone. The replacements take a 13/16″ socket instead of 3/4″, which is slightly less convenient. The Hensley hitch strut jacks take a 3/4″ socket and so do all the stabilizer jacks, so now I have to carry one more socket, but that’s no big deal. 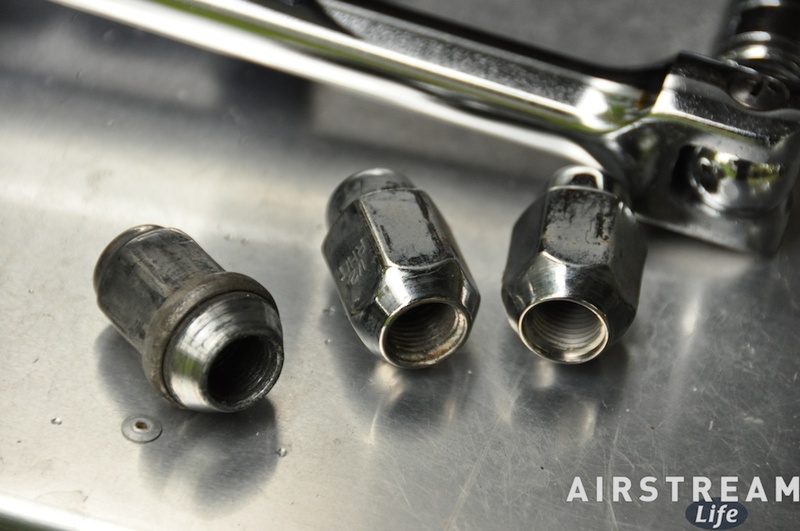 In the photo, the solid nuts are pictured at right, and one of the original capped nuts is on the left. I am still finding reminders of the summer of storage in Vermont. It was sprinkling lightly this morning, so I opened up the awning to cover us while we were working on the curbside. Rolled up inside the awning was a colony of very large ants. They appeared to be dormant, and began to wander randomly around the awning. I knocked them off easily enough, but it was not a pleasant surprise. We’re still carrying quite a few spiders too. They are slowly being captured and removed. I am just hoping we haven’t picked up a load of stink bugs on the east coast like last year. With the rain coming and going we didn’t feel like getting on the roof for the final scheduled repair, the air conditioner. It started getting wonky a few weeks ago, spontaneously shutting off or blowing hot air. We suspect a bad circuit board, which has to be replaced from the top. That’s part of today’s plan. So instead of doing anything significant in the rain, we added a few LED lights in strategic places for future boondocking episodes, including this one in the porch light. The standard incandescent bulb that comes with the light (an 1156) generates too much heat and eventually melts the plastic lens. I don’t know why the OEM puts that bulb in there. 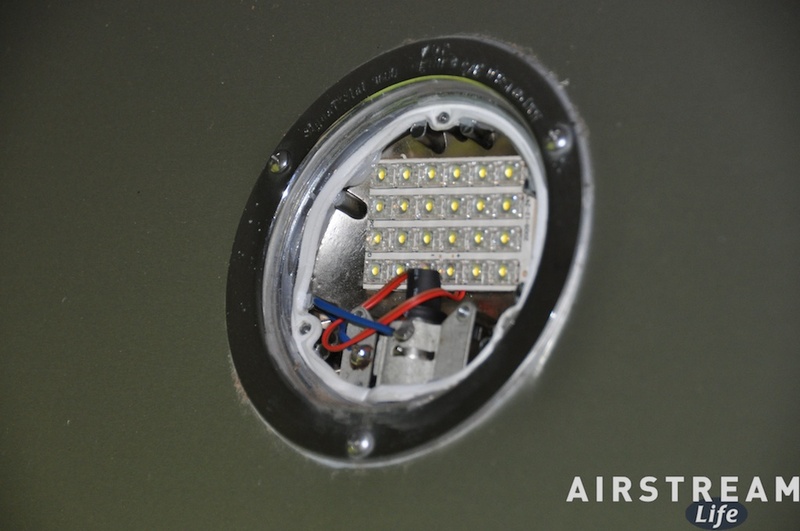 Ours had started to melt but was still usable, so to prevent further damage we swapped it with this plug-in replacement 24-LED array from a fine Airstream Life advertiser, LED4RV. It works great. There’s one other job for today while we’re on the roof. The rain revealed a roof leak somewhere. Water was dripping through one of the ceiling-mounted JVC speakers. Now, we’ve had rain several times before on this trip and not noticed a leak, which provides a lesson. Sometimes leaks aren’t noticeable until the trailer is parked a particular way. 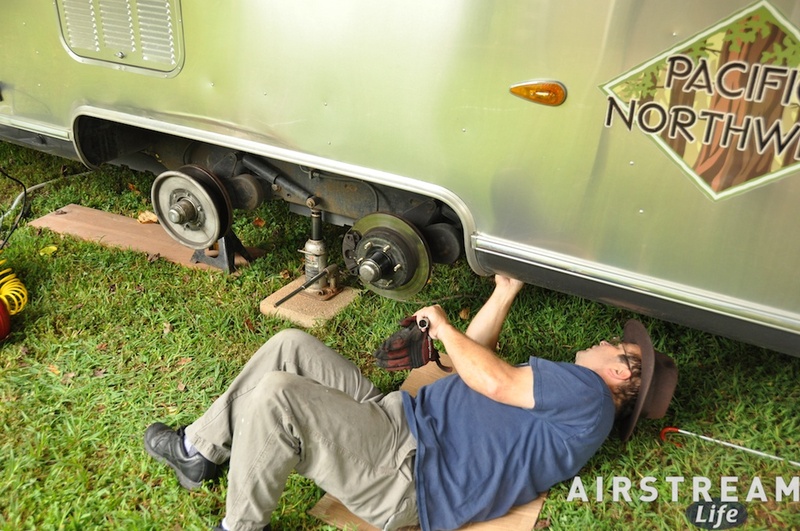 This is another example of how using your Airstream regularly is the best way to keep it in good shape. A leak like this one could have gone unnoticed for months while in storage, until an expensive floor repair became necessary. In this case, we are very slightly nose high and very slightly lower on the street side. This suggests that the leak is coming through the Fan-Tastic Vent in the center of the trailer. I re-caulked that vent last year and was not happy with the caulk I ended up having to use, so I’m going to remove all of the caulk and do it over with something better. While I’m up there, I’ll probably do a few other spots as a preventative measure. I’ll have more to say about that issue in the next blog. Those who are wondering about E&E: they spent the day in the trailer just puttering. Both of them have a cold and will be running at low speed for a few days, but in the gloomy fall sprinkles it wasn’t a bad way to spend Saturday. Looking forward to hearing about any roof caulking. Mine is a 2007 that was built in the summer of 2006. This spring I noticed that some of the caulk on the roof is kind of flaking away and was wondering if I should think about refreshing it. It does look like it’s just the edges of the seams and that the seam itself appears to be okay at this point. I just replaced the base on my front Fantastic Vent. The original was cracked through and through, from edge to edge in several places. It was about 7 years old. Fantastic Vent sent me a new and slightly redesigned base. It took a couple of hours to clean and transfer the guts and cover to the new base. But the real issue was that the cracks leaked water. Not a tremendous amount but enough to have to keep a pan on the floor. So, you might want to take the inner trim piece down from the ceiling and examine the flange coming down from the base for cracks. If it is then likely the crack goes all the way to the outside. The replacement base seems a bit more hefty to me and has fewer screw holes. Otherwise it was a direct exchange. You got it right, Forrest! See the next day’s blog, when we discovered that the base (or “body” as I called it in the blog) was indeed cracked extensively. Unfortunately, with little time to wait for a replacement base because we are traveling, I had to buy a new one in the store. I’ll get the free warranty replacement from F.V. later for the unit we removed. Hmmm. Somewhere I wish there was a compiled list of all the things you should do to upgrade your modern Airstream. Not so much mods (that list is endless), but items where the factory could and should have done better, but didn’t.